Jessica Baverstock has been a great friend and loyal reader of this blog (she's also written a couple of guest posts for me), and when she told me she would be publishing her 100th post last month, I wanted to do something to celebrate. And since I'm a curious sort and have always wanted to know more about her, I suggested an interview. So here it is, complete with photos of her life in China, taken by and captioned by Jessica herself. Thanks, Jessica! 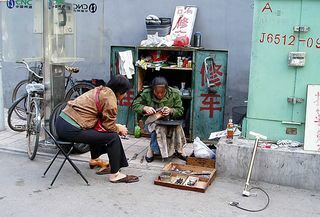 One evening while walking the streets of Beijing, I happened across a little boy and his grandmother. During the conversation we discovered that the little boy and I were both born in the same Australian city! You're an Aussie living in China. For some reason, that fascinates me. Can you tell us why you're there and what you do there? I grew up loving languages. When a friend of mine started teaching me some Mandarin Chinese, I found it addictive but slow going. Then someone invited me to stay with them in China for a month. In that month my language ability leapt ahead, and I discovered the wonders of living overseas. Figuring that China was the best place to learn Chinese (can't argue with that logic) I've lived up here on and off ever since. It's such a fascinating place to live, and the more of the language I master the more I enjoy it. Language isn't just about understanding the words, it's also about understanding the people who speak it. Their intonation, gestures, personalities, culture, logic, history and landscape all influence how and why words are spoken. I love watching people's faces change from concern, annoyance or outright distrust into surprise and openness when they realize they can speak to me in their mother tongue. It opens up a freeness of expression and a window into their soul. I have learned so much from these beautiful people. Everywhere I look there are things to understand, photograph and describe. Even simple trips to the shops, to the doctor, to the acupuncturist all turn into hysterical adventures. What writer can resist that?! I'm planning on starting a new blog soon, devoted to tales of living in China and descriptions of the wonderful people I meet, so I'll be able to share more interesting stories with my readers. To earn a crust I do some work for a charity up here, helping them develop training materials for teaching nannies, teachers, mentors and foster parents how to look after orphaned children. It's a wonderful way to help out with my writing skills. 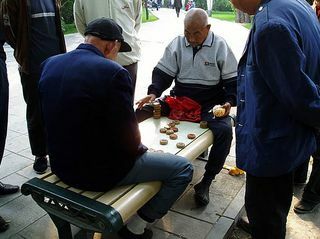 What is the most difficult thing about living in China? For me I think it's the sheer panic of not understanding what someone is saying. I have been studying Chinese for over 7 years now, but there are still so many words I don't know. I'm often presented with situations where I have no idea what is going on. Every time the phone rings or there is an unexpected knock at the door, I steel myself for another interaction which my dictionary may or may not help me through. I have a good Chinese accent, which backfires because the Chinese expect me to understand more than I actually do. I had an argument with a telemarketer once because she thought I couldn't possibly be a foreigner with my accent, and I was telling her I didn't understand what she was saying. 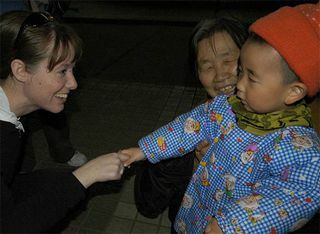 Still, these experiences have given me valuable insights which I can then use to relate to foreigners in my own country. I'd really love to hear more about your writing. First, I know you have an Ebook coming out soon. Can you talk about that? I recently released my first e-book, Tips for Those Contemplating Insanity. It contains 15 tips I've found useful for coping with overwhelming situations, and I'm already hearing back from people who love it. The e-book is available for free when you sign up for the Creativity's Workshop Newsletter. After completing that e-book, I decided I should write something which specifically dealt with the stress and guilt writers often feel. As writers, we're under a lot of pressure to be creative, to pump out work, to accept criticism, to market ourselves etc. I personally find this takes the fun out of writing and saps me of energy – sometimes even leaving me too stressed to face the page. So I wanted to write something which would free me (and other writers) from this pressure – a book with comforting reminders, helpful tips and gentle reassurance. Unfortunately, it's so much fun to write, and there are so many areas to cover, that it's turning into a far longer project than my last one! Still, I'm enjoying the journey and am really pleased with how it's coming together. If you need your bike repaired, shoe resoled, keys cut or any number of other handy jobs done, you can find someone on the side of the street with the equipment and skills. Fascinating conversations are all part of the service. And how about your novel? During National Novel Writing Month (NaNo WriMo) last November I started writing a novel about Edward, an English businessman whose company sends him to China for work. It gave me a wonderful opportunity to take my Chinese experiences and wind them into a plot. Because Edward writes manuals for a living (like moi) I'm experimenting with turning the novel into a manual for life in China, while weaving in plot throughout. It's still in experimental stages (such fun!) and full of sparkling potential. I can't wait to see how to comes together. What are your writing dreams? If I could wave a magic wand and give you exactly what you wanted, writing-wise, what would it look like? The confidence to believe in my ideas, to write my words, to market my work, to interact with other writers, and to bring humour, inspiration and entertainment to my readers – without the fear of not being good enough or losing my creative voice. The skills/ability to craft stories, delve into characters and polish my work so that everything I work on will be good enough to be released to readers. The freedom to explore plots, creative concepts and projects without having to worry about a bank balance or what others might think of the outcome. The energy to complete all the projects spinning in my mind. Basically, it would look like lots and lots of my books available to be enjoyed by readers. Oh, and while you're at it, can I have a lifetime supply of exquisite journals and perfect pens? Isn't Jessica wonderful? Before you go visit her blog, what's your take-away from the interview? Please leave a comment. Create a successful, inspired writing life: Do you have an e-book in you like Jessica? What are you an expert in that you could write about? If you liked this post, stay in touch. Subscribe to my newsletter (form to the right) and/or subscribe to the RSS feed (orange button or form to the left). Thanks for dropping by!